We've all heard Democratic presidential candidate Bernie Sanders' track record on civil rights by now. He was at the March on Washington, he organized sit-ins to combat racial segregation in Chicago, he was arrested at a protest, and he has a strong voting record on civil rights issues. As a result, the self-declared Democratic socialist from Vermont is a progressive champion for many. However, activists have been urging Sanders to center anti-racism in his campaign, and have criticized him for repeatedly attributing systemic racism almost solely to economic inequality. These criticisms came to a head Saturday at the annual Netroots Nation convention, where American political and progressive activists gathered at a presidential town hall in Phoenix, Arizona, to hear journalist and immigration activist Jose Antonio Vargas interview Sanders and former Maryland Gov. Martin O'Malley. 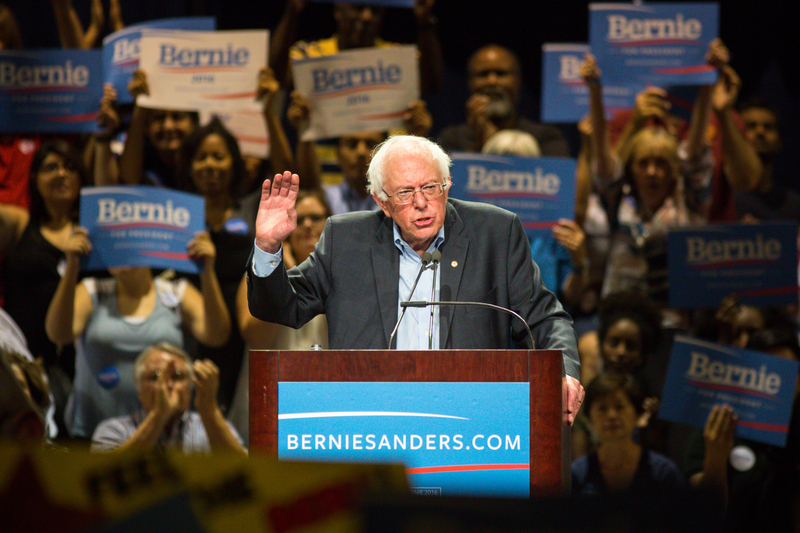 When #BlackLivesMatter activists streamed into the event to confront the candidates on police brutality, mass incarceration, and other issues of structural racism, Sanders quickly lost his patience. He was a couple of minutes into a stump speech about corporate control of media and economic policy changes when protestors demanded that he #SayHerName, referring to Sandra Bland, Kindra Chapman, and other black women who have died in police custody. His response, according to many critics, fell short. Black lives, of course, matter. I spent 50 years of my life fighting for civil rights and dignity, but if you don’t want me to be here, that’s okay. I don’t want to out-scream you. Sanders then transitioned to remarks about black youth unemployment in America, his classic fall-back point. He said, to applause from the crowd, that "it is time to invest in jobs and education, not in jails and incarceration." But when he and Vargas settled down for the interview portion of the event, protestors insisted: "I want Bernie Sanders to say my name!" and Sanders rapidly grew impatient, asking Vargas what was happening. Vargas, of course, did not silence the protesters as Sanders might have hoped, but rather used their chants in a question. Vargas: I heard somebody say that black people are dying in this country because of white supremacy. What do you say to that? Sanders: Black people are dying in this country because we have a criminal justice system which is out of control, because we have a system in which, as I've just mentioned, over 50 percent of young African American kids are unemployed, are out in the streets, and where we have right now, it is estimated, that a black male baby born today stands a one in four chance of ending up in the criminal justice system. But Vargas did not let Sanders go, and instead urged him to unpack his statements even more by asking him to confront systemic racism, and not just economic inequality. When Sanders continued to talk about building jobs and improving the economy, Vargas pressed on, asking him to name policies he's supported in the past decade that have benefited communities of color. Sanders — after saying that he's supported "many" policies — briefly discussed the Affordable Care Act. Following the event, despite all his impatience, Sanders did tweet #BlackLivesMatter. But a couple of tweets do not remedy the situation at hand on their own. Sanders' comments were problematic for many reasons, the first being that he is a white man in a position of power who used his track record on civil rights to avoid directly responding to the black activists that were right in front of him. Secondly, whatever Sanders has done to further racial equality — and he has done a fair amount — his use of a public, progressive space to talk about what he has already done and not what he will go on to do was not appropriate. It should concern Sanders' supporters that he is quick to go on the defensive when he is challenged on the basis of structural racism. No one is denying that he has done a great deal of important civil rights work, nor is anyone saying that he does not seek equality. But what activists are saying, as the Netroots action should have made clear, is that Sanders (and the other Democratic candidates) need to publicly and explicitly support the #BlackLivesMatter movement and outline specific policy plans that would, as Vargas put it, benefit communities of color. It is not enough for Sanders to argue for jobs and education. Despite being someone who likes to call for a political revolution — for a grassroots movement — Sanders has consistently fallen back on economic justice without understanding why people of color so sincerely want him to discuss racial justice. He frequently cites statistics about youth unemployment and mass incarceration, which are certainly important and often missed by other liberal candidates, but in the process, he is speaking over the lived experiences of communities of color whose realities are currently inextricable from fear and oppression. This showed at Netroots just as it has during the rest of his campaign. Sanders should not have treated the #BlackLivesMatter activists as a nuisance but rather as the very thing he was calling for: mobilization of the people for the issues they care about. After attributing "black lives matter" to "phraseology" in the past, it is significant that he has finally used the hashtag on its own, but we'll have to wait and see if his actions back up his tweets. One thing is completely clear, though: Sanders cannot continue to mention his past civil rights work as though it is sufficient, because racism obviously hasn't disappeared into obscurity and there is always work left to be done.